Top photo by Wiebe Nijland. Bottom left: photo by Nathaniel Glickman. 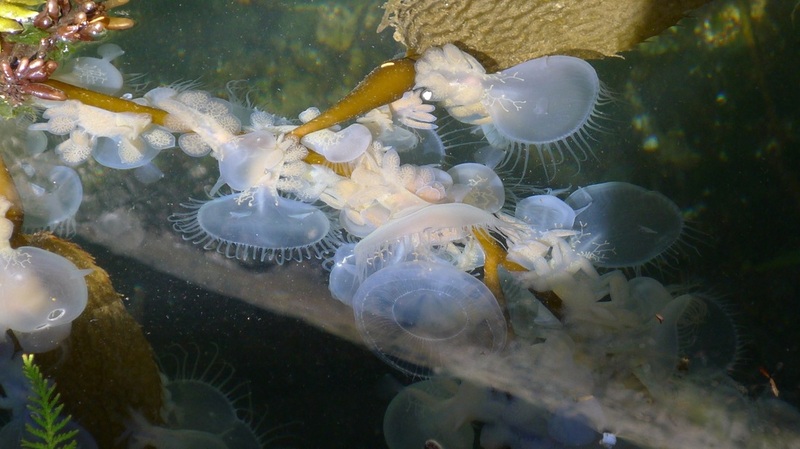 Bottom right: hooded nudibranchs feeding near a dock, photo by Linda Brown. The hooded nudibranch is easily recognizable by it's uniquely large, tentacle-fringed oral hood. Small stout, rhinophores attach to the top of the hood in an ear-like fashion. Pairs of paddle- or flipper-like appendages (respiratory appendages called cerata) line its body behind the hood, in a manner reminiscent of a stegosaurus (illustrated in this image). The nudibranch's body is mostly translucent, but may be tinged with yellow, greenish gray, or brown. It can be up to 17.5 cm long. 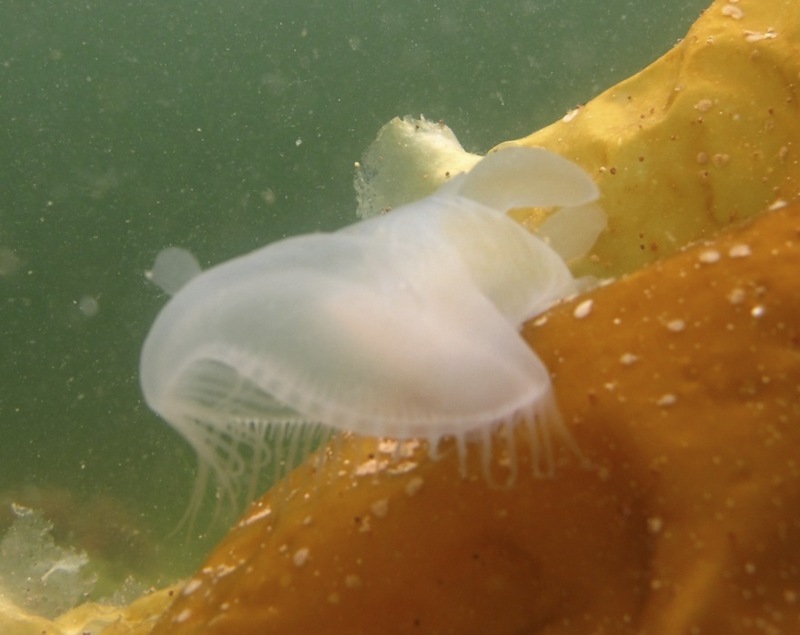 The hooded nudibranch is found on rocks, eelgrass and kelp in the low intertidal and subtidal, to 37 m deep. Large aggregations of this species on kelp and eelgrass are not uncommon at warmer times of the year. If dislodged or disturbed by a predator, this species may also be seen "swimming" in the water column by flexing its body back and forth towards a new location (click here for a video with footage of this surprising behaviour). 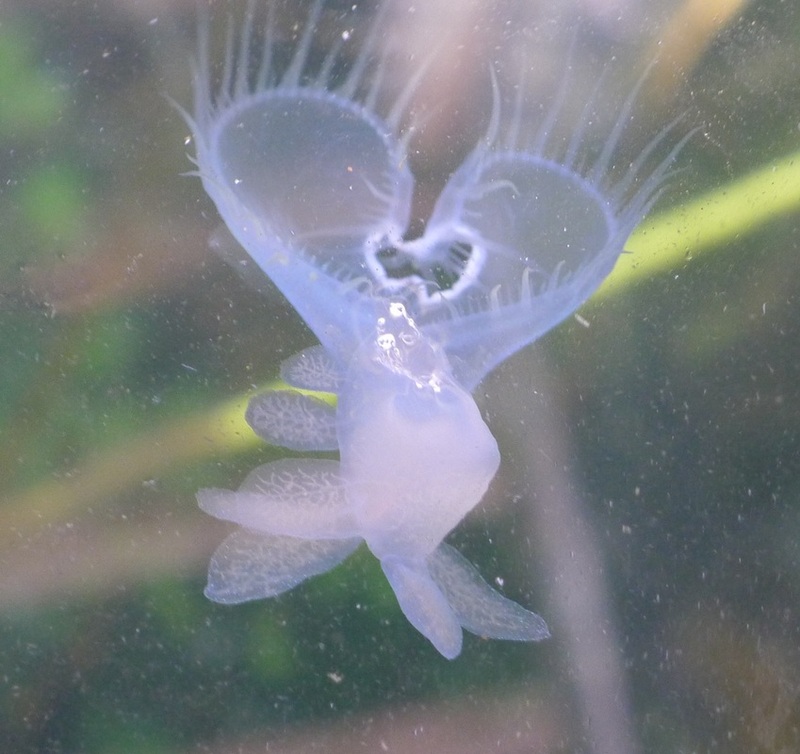 The hooded nudibranch's range extends along the Pacific coast from Alaska south to California. 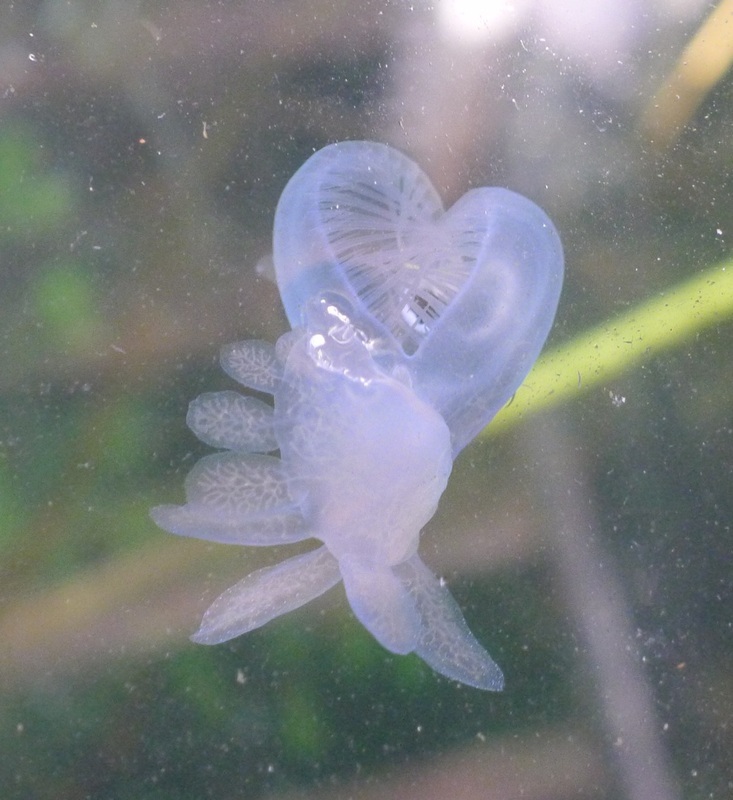 Its translucent appearance and tentacle-fringed hood gives the hooded nudibranch a somewhat jellyfish-like appearance, particularly when "swimming" in the water column. This nudibranch uses its flexible and expandable hood to capture prey, such as zooplankton, jellyfish, and even small fish. 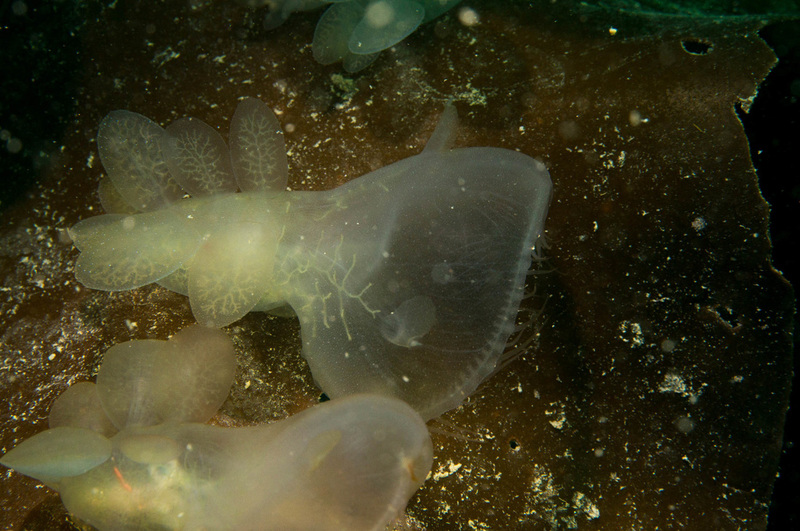 Once trapped in the hood, the two sides of the hood sweep together, the tentacles hold the prey in, and the hood contracts to force the food towards the nudibranch's mouth. Click here to watch this feeding technique in action. The hooded nudibranch produces secretions which have a sweet smell often equated to the smell of watermelons or other fruit. While most predators avoid this nudibranch based on its secretions, the kelp crab (Pugettia producta) is a rare exception. 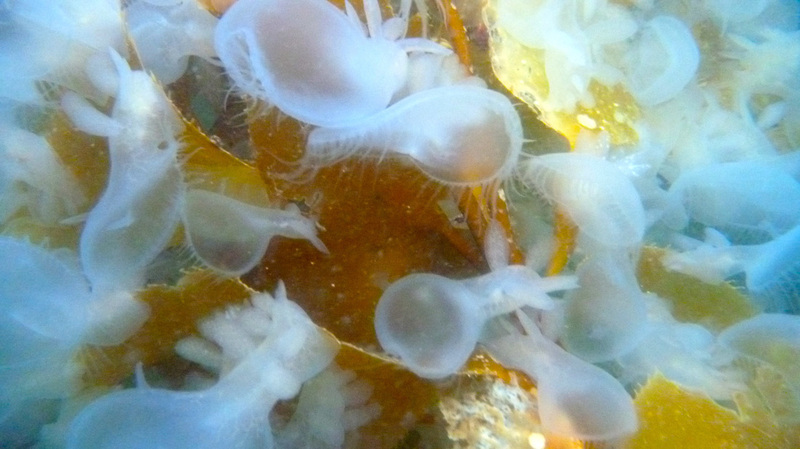 While this hooded nudibranch is the only Melibe in the Pacific Northwest, worldwide the genus is composed of more than a dozen accepted species. Click here for an light-hearted article about the unique aspects of this genus (described as "a cross between a dinosaur, a jellyfish, and a watermelon"). 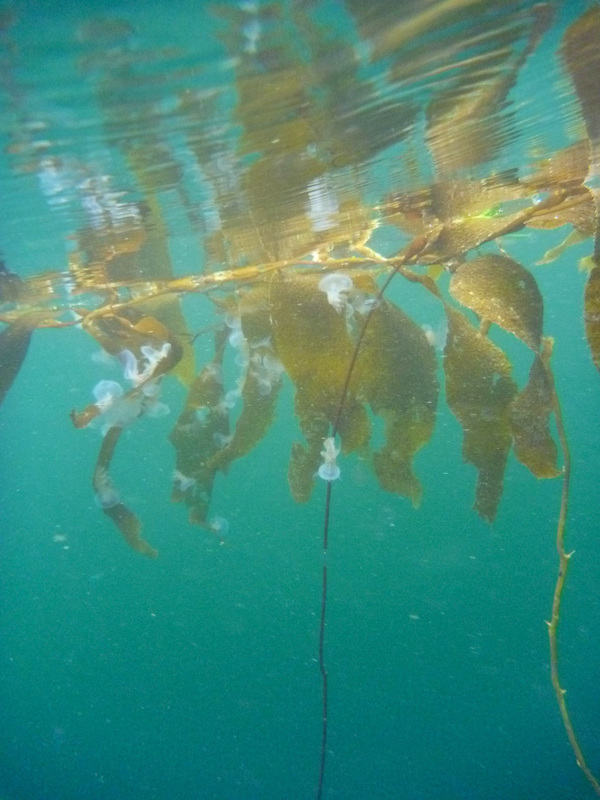 Left and top right: aggregations of hooded nudibranchs on kelp, photographed by Angeleen Olson. Bottom right: this view is of the underside (foot), with the two images showing the progression of hood contraction during feeding. It appears to be attached upside down to the surface of the water, via surface tension, rather than actively swimming. Photos by Linda Brown. Harbo, R. M. (1999). Whelks to whales: Coastal marine life of the Pacific Northweest. Madeira Park, BC: Harbour Publishing. P. 117. Melibe. Monterey Bay Aquarium. Accessed 07/01/2016.